Last year, Jean Swanson’s campaign for Rent Freeze and Mansion Tax shaped the Vancouver by-election. This coming October, there is a general election, and Jean Swanson and her team are calling on residents and all candidates to support the City We Need platform. After more than a dozen years of the developer-backed parties, NPA and Vision, running City Hall, Vancouver has never been more ready for sweeping political change. With your help, we can make it happen! 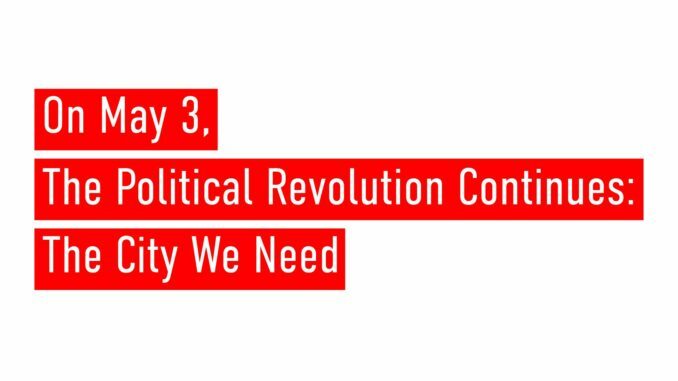 On Thursday May 3rd come to Vancouver City Hall at Noon to learn about this people’s platform, and to show your support for bringing a political revolution to City Hall. While some other parties and candidates have been focusing on backroom deals, Jean’s Team has been focusing on policies. The City We Need platform builds on Jean Swanson’s popular policies from last year, and extends them to other policy areas, including public transit, child care, environmental justice, democratic reform, local small business, and much more. Many people in our city are struggling to pay for rent, tuition, transit, or day care. Wages and social assistance rates are far too low. Many are losing their homes or places of business to soaring rents and gentrification. When we all unite around a strong platform, pushing all levels of government to come through with what we need, only then can we start to win the City We Need. This is a people’s platform – not a typical campaign document. We want your input on this platform, and Jean and others will be participating in meetings around the city, at community centres, co-op common rooms, and around kitchen tables to get your feedback and advice on how to fight for the City We Need. The public space in front of City Hall where the rally will take place is wheelchair accessible. Transit: #99 B-line to Broadway and Cambie, or #15 Bus to Cambie and 12th, Canada Line Skytrain to Broadway-City Hall. This rally will be held on the unceded and occupied territory of the mi ce:p kʷətxʷiləm (Tsleil-Waututh), Skwxwú7mesh Úxwumixw (Squamish), and xʷməθkʷəy̓əm (Musqueam) Nations.